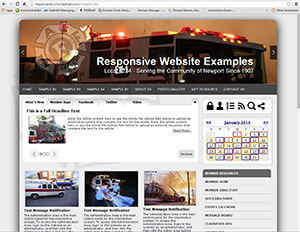 UnionActive is happy to announce the release of our new Responsive Design templates! Responsive design is a way of building a single website that works seamlessly on both desktop browsers and the wide array of mobile devices on the market. Responsive architecture gives your site the best quality browsing experience - whether on a smartphone, tablet, netbook or e-reader, regardless of the operating system. Responsive websites automatically adjust according to the device’s screen size and orientation. 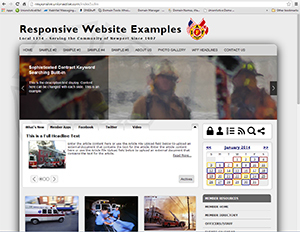 Large or small - landscape or portrait; responsive sites switch between these on-the-fly. There is no more need to manage a separate mobile site that has different content and looks nothing like the desktop site. Websites utilizing responsive design offer a more app-like experience to their users when viewed on a mobile or tablet device, all from the same website. Responsive design is a forward-thinking technology, as it creates sites that will work on next year’s devices. The website is flexible and responds to the exact size of the screen viewing it. When a new device comes out that’s a little larger or smaller, it’s going to work well on it too. 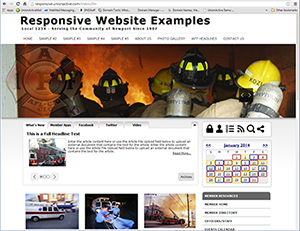 Click the thumbnail images below to view our sample responsive design layouts. These sites are for demonstration only and can be custom tailored to your requests. Open each link on a desktop computer, then slowly drag your browser window from full screen to a very thin size and watch the website dynamically adjust on-the-fly. Drag it back out to full screen size to see it adjust back to full width. Notice when the browser window gets thin enough everything adjusts to fit a mobile screen. Next, open the samples on a smartphone, then on a tablet, and see how it adjusts appropriately. With a responsive design, the user does not have to manipulate the site using “pinch and zoom,” and the flow of content is more appropriate when the screen size is smaller. 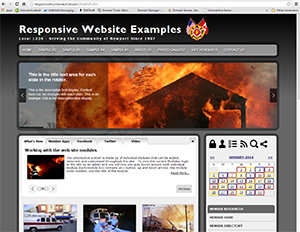 Installation Includes: Setup of the responsive template of your choice in your current UnionActive website. We will also adjust the colors and background image to your sites specifications. If you send us full size images for the rotating header we can upload those images and get them setup initially as well. You will be able to change or add images at any time through the admin area. All content, members, and other functionality of your website will be maintained. We can also customize other parts of the templates or mix and match parts of one template with another. Just let us know what you like. 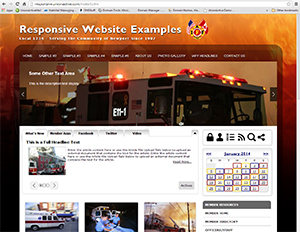 Contact us to request a Responsive Design template for your UnionActive website!